Suspense had been building over the weekend with an online contest to guess who and where the latestroute addition from Bangor International Airport(BGR) would be. The airport posted a contest to guess the route for a chance to win tickets to the Bangor Waterfront Brewfest this summer. 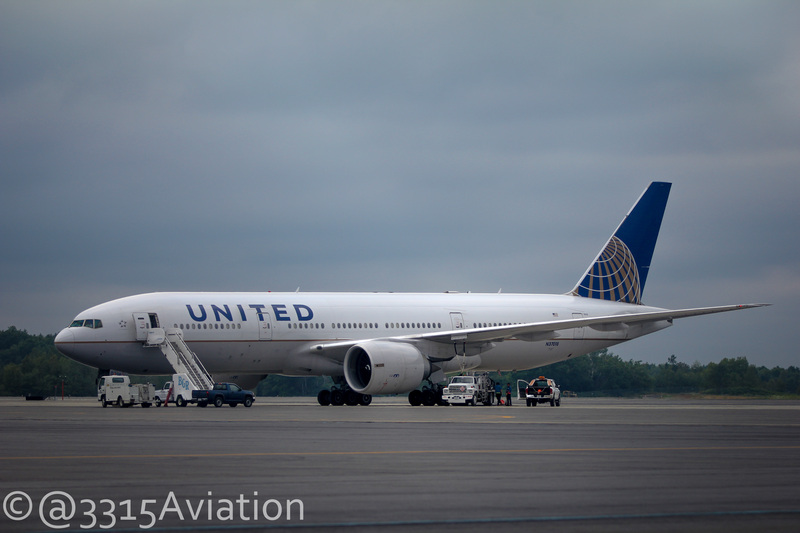 A United Boeing 777-200 sits on the ramp in Bangor after diverting due to bad weather in Newark. In an announcement at the airport this morning it was revealed that United Airlines was making a return to Bangor with service to Chicago’s O’Hare International Airport. The service will start June 5th and run through December 2nd with second flight added from July 1st through August 31st. Service will be on a 70 seat Bombardier CRJ700 regional jet. United last operated out of Bangor in 1993. The return was part of a Small Community Air Service Development Program grant received by BGR in 2013 to bring United back. Under the grant, United is guaranteed a minimum revenue to provide connecting flights to Chicago or Washington’s Dulles International Airport. This is a great addition to BGR to provide connecting flights from Chicago to points in the western areas of the United States. It will be interesting to see if the service takes off and becomes year round and potentially expand with service to United’s hubs at Newark or Dulles. Admittedly I forgot all about the grant to lure UAL but honestly thought it would be either an Allegiant flight to Las Vegas or something with the new American/US Airways merger. My money was on Allegiant to Las Vegas given the draw with Canadian traffic.